Length18 to 20 inches ; female the larger. Male and FemaleUpper parts grayish brown, each feather with two or three white or buff bars ; facial disk gray, finely barred or mottled with dusky; eyes bluish black, and bill yellow; under parts white washed with buff; the breast barred; the sides and underneath streaked with dusky ; legs and feet feathered to nails ; wings and tail barred with brown; no ear tufts. RangeEastern United States to Nova Scotia and Manitoba; west to Minnesota, Nebraska, Kansas, and Texas; nesting through-out range. Whoo-whoo-too-whoo-too-o-o, with endless variation, a deep toned, guttural, weird, startling sound, and haw-haw-hoo-hoo, like a coarse, mocking laugh, come from the noisy hoot owl between dusk and midnight, rarely at sunrise, more rarely still by day, sometimes from a solitary hooter, sometimes in a duet sung out of time. Every one knows the hoot. One hears it most frequently at the nesting season. Once in a very great while this owl gives a shriek to make one’s blood curdle. Many of us have attracted the bird by imitating its notes. Because the voice of the great horned owl, that “tiger among birds,” is so like it, the barred owl is credited with its larger kinsman’s atrocities and shot. Its own talons are not wholly guiltless of innocent blood, to be sure, since out of one hundred and nine stomachs examined by Dr. Fisher for the Department of Agri-culture, five contained young poultry or game, and thirteen other birds ; but over one-third contained mice and other small mammals; frogs, fish, lizards, and insects filled the remainder, which goes to prove that, in spite of the average farmer’s belief to the contrary, this owl renders him positive service. To see the barred owl is to identify it at once by its smooth, bland, almost human face, its mild blue black eyes, and the absence of horns from its round head. Woods, waysides, and sheltered farms are the barred owl’s hunting grounds; and because it so frequently lodges through the sunny hours in hay lofts and stacks, many people call it the barn owl, a name which should be discouraged by disuse to save the endless confusion arising by the application of the same popular name to two or more different species. True barn owls are not only a distinct species, but constitute a separate family. The unearthly, weird voices of several owls make each one indifferently a ” hoot owl ” to the average listener. In February, the barred owl loses his unsocial, hermit-like instinct, and for his mate’s society, at least, shows a devoted preference. The pair go about looking for a natural cavity in a tree in dense or swampy woods; but that failing them, they unscrupulously take possession of a hawk’s or crow’s nest, tenaciously holding it year after year, as all owls do their homes. They rarely build a nest of their own, or take pains to line a cavity or to alter an appropriated tenement unless it should need repairs. Mr. C. L. Rawson has found a set of eggs lying on a solid cake of ice near Norwich, Conn., so early is the nesting done. A camera can take no more amusing picture than a group of owlets perching on a naked limb near their cradle, their downy feathers ruffled by the March wind, a surprised, comical expression on their faces, their bodies closely huddled together to save warmth. The Great Gray, or Spectral Owl (Scotiaptex cinereum), the largest owl in the world, is dusky, mottled with white on its up-per parts, and the white under parts are broadly streaked on the breast, and on the sides and underneath irregularly barred and streaked with dusky. 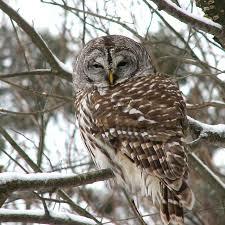 It has no ear tufts; its legs and feet are heavily feathered, and both bill and eyes are yellow. It is a very rare visitor from the far north, and as it keeps to dense woods, few bird students have been so fortunate as Dr. Dall, who has caught it in his hands. He declares it is ” a stupid bird.” No owl that is heavy with sleep while humans are wide awake is credited with great cleverness, and modern ornithologists consider that Minerva made a mistake when she chose the owl to typify that wisdom for which she was revered.